Kurokami Medaka, a first year, is elected as Student Council President, and the first thing she does is establish a suggestion box, later dubbed by students the "Medaka Box". Medaka encourages students to submit any problem to the box without hesitation and promises to take on any issue from anyone. Since Medaka won the Student Council elections with a staggering 98% of the vote, she ends up as the Council's only member. She asks her childhood friend, Hitoyoshi Zenkichi, for help and he grudgingly agrees, becoming the Student Council's lowest ranking member. 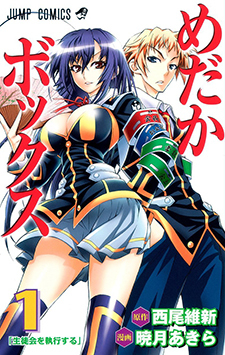 Soon Medaka recruits two more people to the Student Council, the former judo club member Akune Kouki as secretary and the current swim club member Kikaijima Mogana, on loan for 300 yen a day, as treasurer. Now the Student Council members spend their days solving the problems submitted through the Medaka Box, whether they be hooligans in clubs where they don't belong, girls who need help writing love letters or people who've lost their pets, gradually earning the respect and admiration of the entire school.